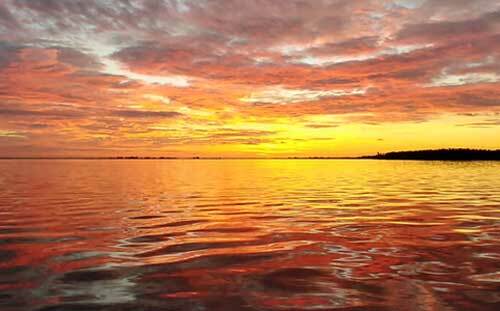 Explore the waters, beaches and wildlife of Sanibel Island. Here at MangroveMasters we are…. Dedicated to spreading the art of inshore fishing and knowledge of Sanibel & Captiva Florida waters. 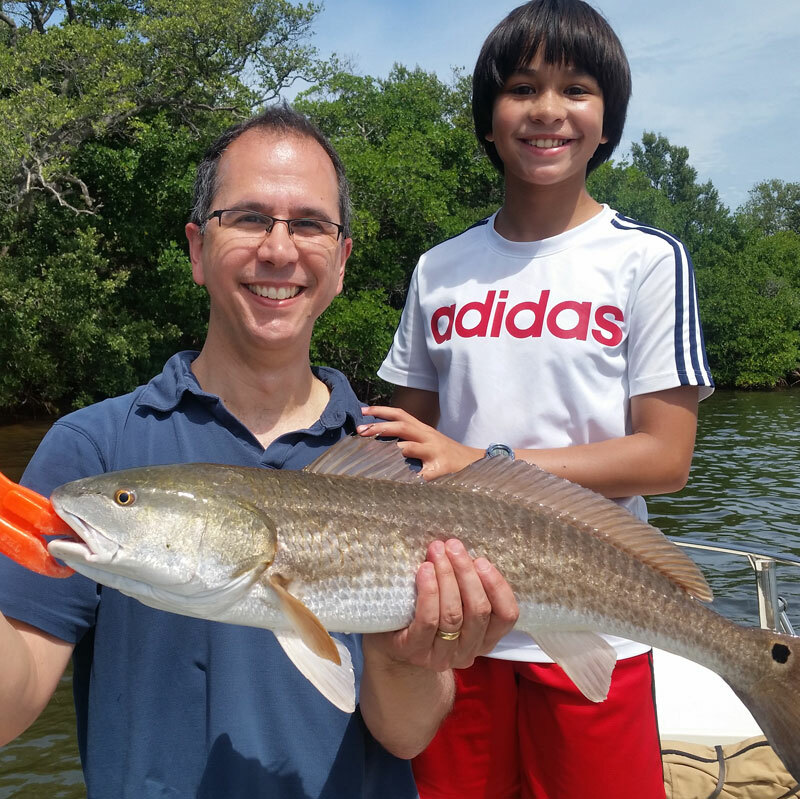 MangroveMasters will create lasting memories for you and your family through private and personalized charters. 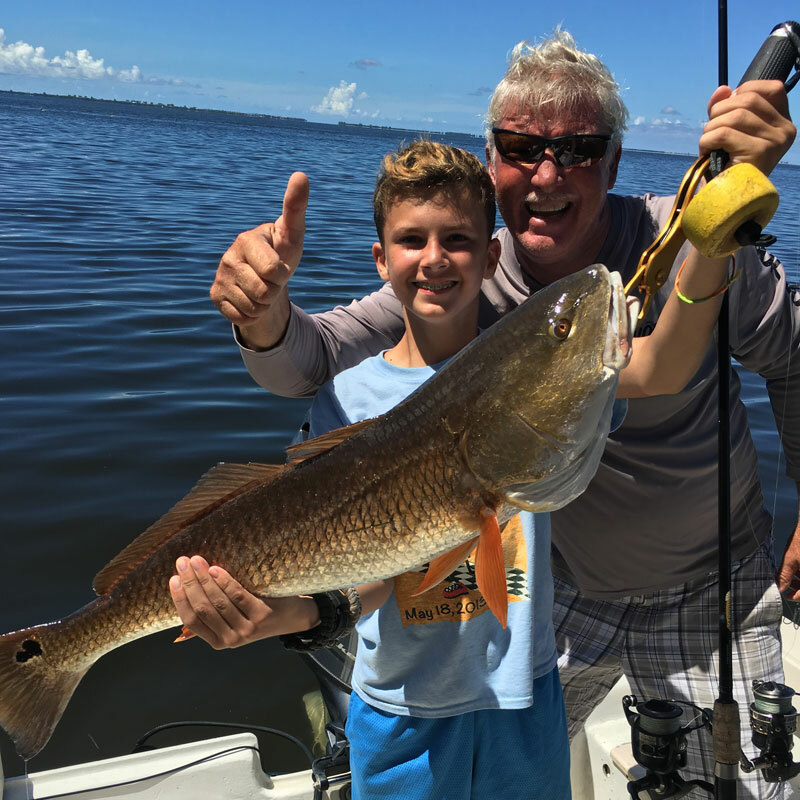 Under the guide of Captain Jack Boutchyard, a USCG Certified Master Captain and Florida native, you can visit the areas (and its inhabitants) of Redfish Pass, Bokeelia, Pineland, and many more. 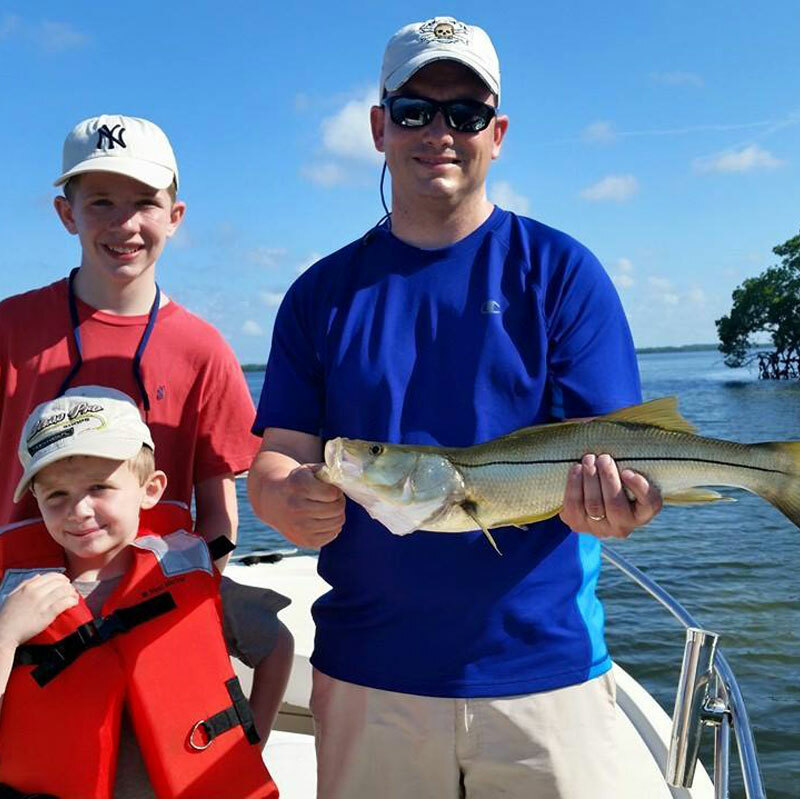 From inshore fishing charters to beach shelling trips, the MangroveMasters experience offers the opportunity to take in all of Southwest Florida’s true beauty. Sanibel and Captiva guided flats fishing charters explore the grass flats, oyster bars and Mangrove Islands from Redfish Pass to Tarpon Bay for fish of all species. Captain Jack offers knowledgeable hands on, guided fishing charters for fishermen of all experience levels. 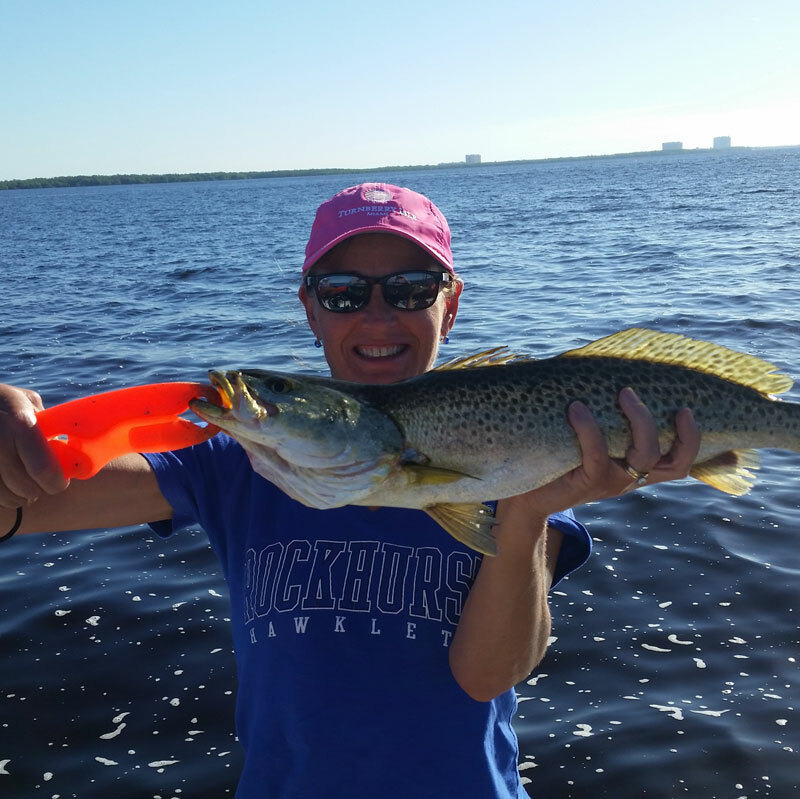 From Trout fishing on the grass flats, to observing tailing Redfish at low tide, each trip is tailored to your preferred species or style of fishing. Give Captain Jack a call and he will be glad to discuss your trip today. 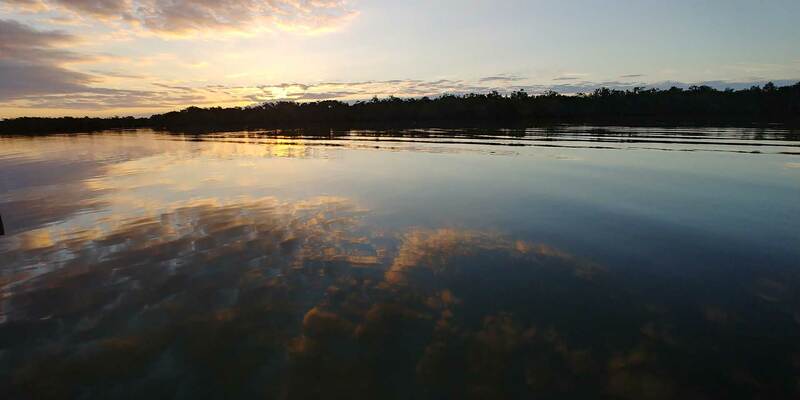 ​Rates are for up to FOUR anglers Add $50.00 for each extra person up to 6 total. Parties of more than 6, or large groups please call for multiple boat rates. Trips include: fishing license, bait, tackle, rods and bottled water. Captain Jack also takes pictures of you and your catch during each trip and is happy to email them to you free of charge! We strongly recommend you bring sunblock, sunglasses, camera, towel and additional food and beverage if needed. Please refrain from bringing aerosol sunblock as it is harmful to the vessel’s upholstery. 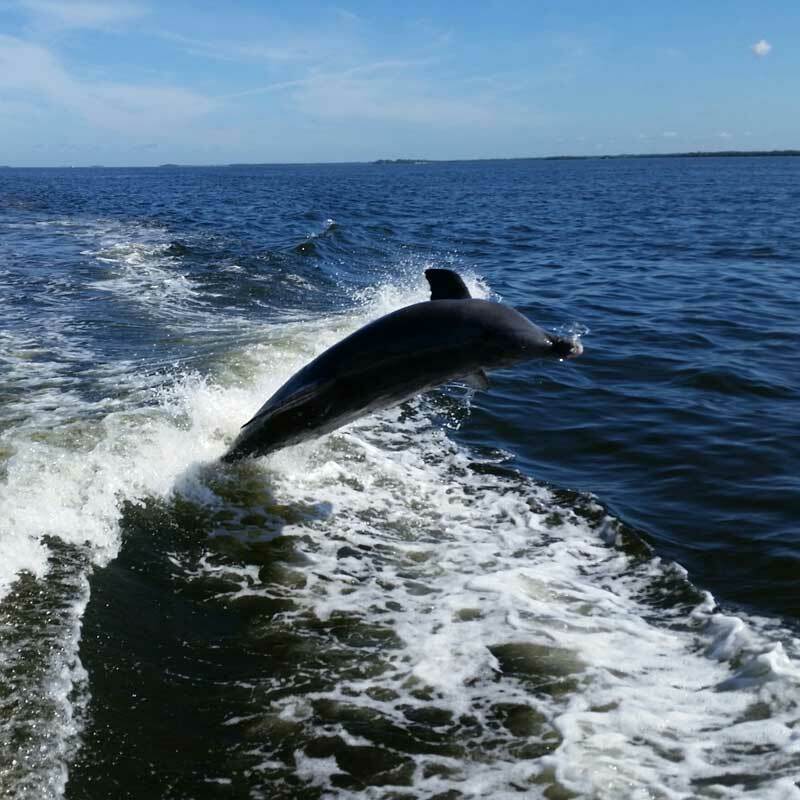 A 2 hour Private Dolphin Cruise around the waterways of Sanibel, Captiva and Pine Island. 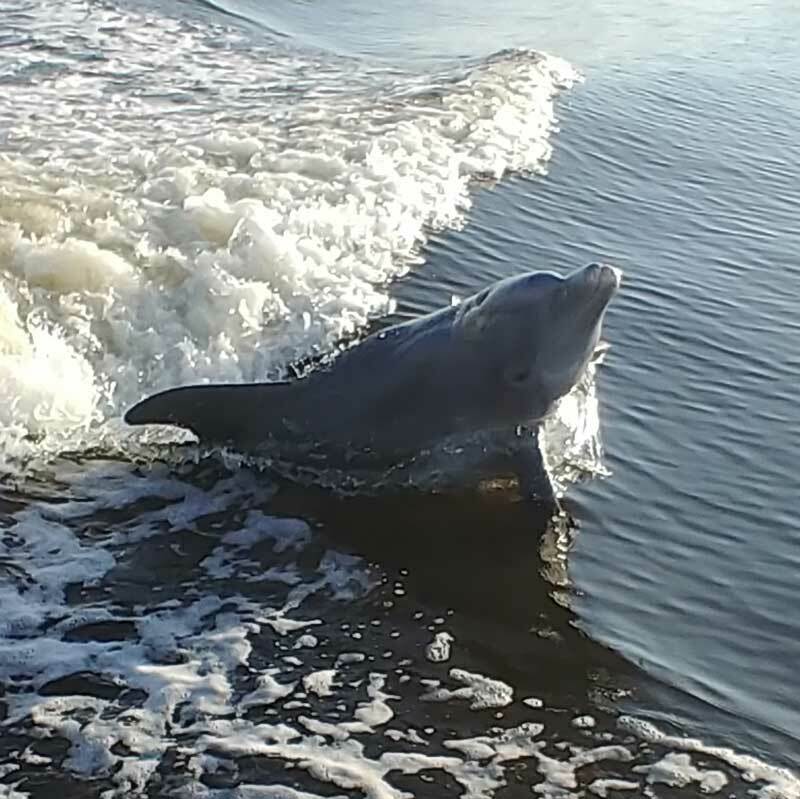 Keep a sharp eye out and you will see some of Sanibel’s most treasured mammals, the Dolphin. 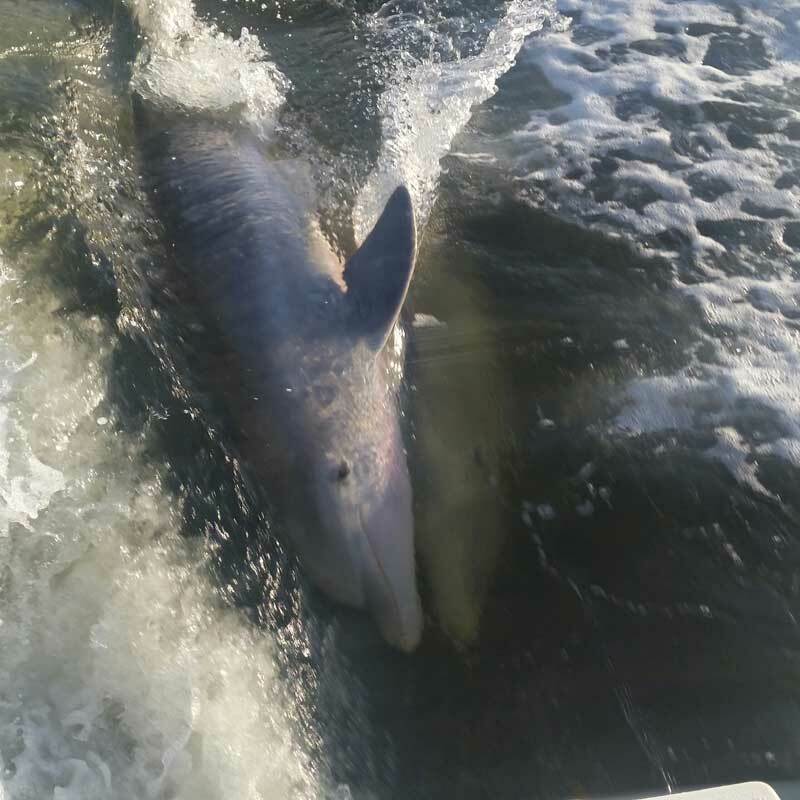 While on your private Dolphin Cruise, you will observe dolphins feeding and playing from a safe distance, and on some occasions you may see them playing with fish they have caught like a toy. 9:00 a.m., 11:30 a.m. and 2:00 p.m.
Rates are $250.00 for up to 6 people. Dolphins and Manatees have a reputation for being very curious, friendly, social mammals. I have observed this personally for years. It has always been my rule that we never do anything to entice or harass them. We do not feed them, but we do watch them feed and play in their natural environment from a safe distance. On some occasions I have observed them playing in the boat wake; this they do on their own. The young Dolphins love to jump and play. On several trips we’ve observed them playing with floating mangrove seeds and leaves as if they were toys, and also manatees feeding on turtle grass as they float over the grass beds. 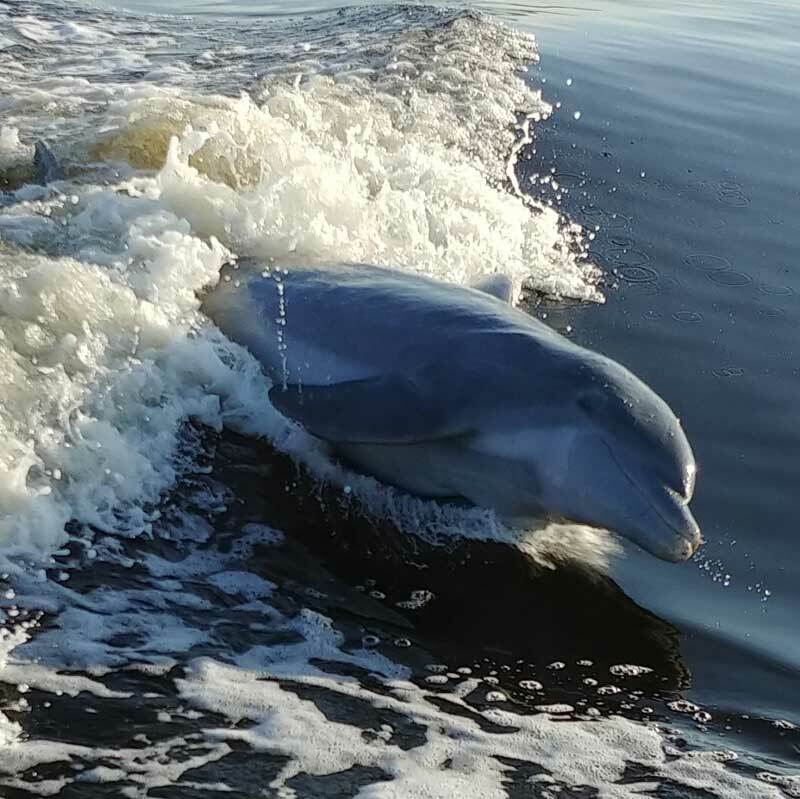 So come along and enjoy an Eco-Friendly Dolphin Cruise with MangroveMasters and observe Dolphins and Manatees in their natural habitat. Sanibel Island is one of the top destinations in the world for shelling. So much so, locals dubbed the art of bend at the waist while scouring the shores as the ‘Sanibel Stoop’. On a MangroveMasters beach and shelling excursion you will have the opportunity to visit some of Sanibel and Captiva Island’s most exclusive beaches (some only accessible by boat) and search for our area’s native gems. So bring your shell bag and sunscreen and let’s do the Sanibel Stoop! 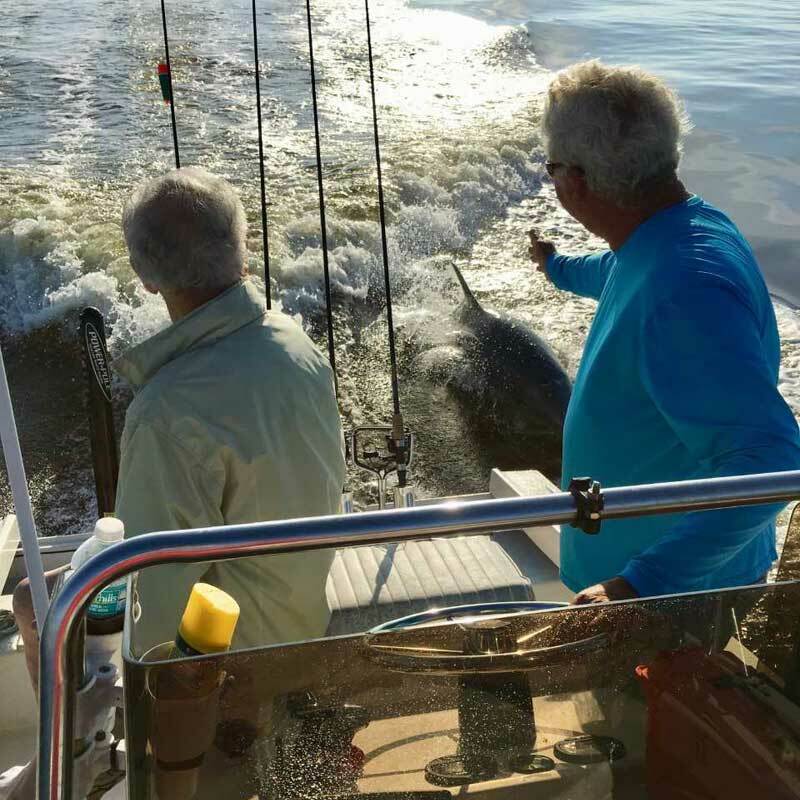 "Captain Jack was the best..And the tour was well worth the money and more....We had a great time and to say what a great time we had is putting it mildly...HIGHLY RECOMMEND...GREAT DAY....."
"Captain jack is great- very committed to excellent service and very flexible schedule wise. my kids and I had a blast and saw beautiful dolphins. Will def be back for dolphin cruise or one of his fishing trips........"
"Capt Jack was the greatest...It was a tour filled with eco info...The dolphins were everywhere, they even followed the boat twice and continually danced during this time...This was all due to Captain Jack's expertise.....The Captain was personable and welcomed continuous questions...This tour was soooo worth while..."
" I can not begin to tell you what a wonderful time I had on a half day trip with Captin Jack. His knowledge of the area and his relationship with the the animals in and around it added a specialness you won't get just anywhere. His smaller boat accommodates four people which allows for a more intimate experience then one of the bigger 50 person boats. 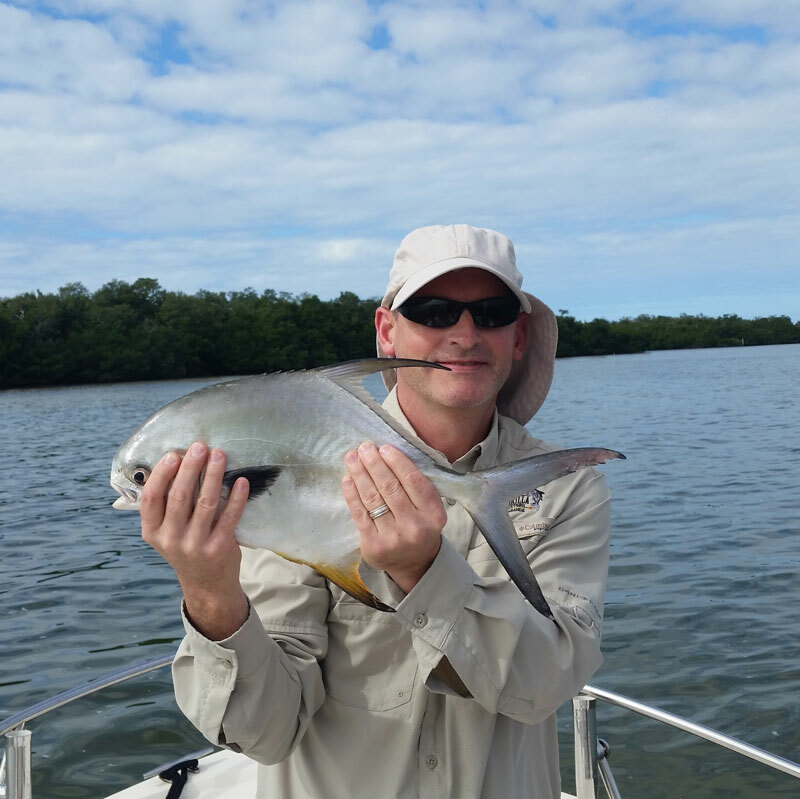 If your in the area and want to to anything like shell finding, dolphin watching, or fishing, I would highly recommend Captin Jack and Mangrove Masters!!!!" "Great Time! This was purchased for the purpose of a gift for my daughter's 13th birthday. Our party of four enjoyed the trip more than we could have imagined. The Captain is knowledgeable, courteous and provided a great tour. My daughter at 13 enjoyed seeing dolphins of all sizes and ages up close and observing them in there own habitat. Mothers and baby’s swimming playing and feeding as well as individual pods coming together allowing the baby’s to mingle with other baby’s while the mothers watched and joined in. This was an awesome memory for my daughter and our friends to have and share for years to come. I am no stranger to beaches and boating but would say by far this was the best gift and experience on the water. You will enjoy this novice or not!" Please fill out our contact form below to schedule your adventure today. MangroveMasters accepts all major credit cards. – Deposit required at the time of booking (deposit amount varies dependent on charter). – Cancellations that occur within 48 hrs of charter date, or in the case of no shows, forfeit the deposited amount. – Weather related interruptions will result in rescheduling, based on availability. If charter cannot be rescheduled the deposited amount is refunded. Content copyright © 2018. MANGROVEMASTERS.COM. All rights reserved.